Giving back is important part of what we do at Platinum Recruitment. Each month we continue to support the nominated charities from our top hospitality recruiters. 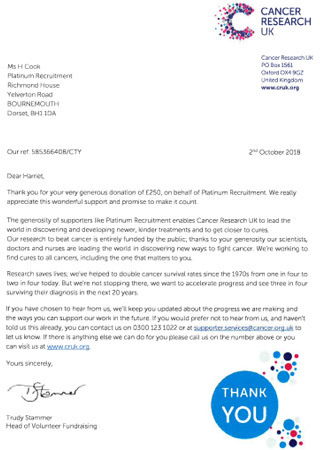 Our team generously donate from their own salary and Platinum Recruitment matches the team’s total. This month, our lucky winner was Harriet, our Assistant Manager Administrator. Harriet made a wonderful suggestion to donate the collective donation of £250 to Cancer Research. Thanks to the support of their workers and donators, Cancer Research have helped double cancer survival rates since the 1970’s. They aim to increase this amazing progress and achieve an average of three in four cancer survivors in the next twenty years. If you would like to show your support for Cancer Research, please visit their website, Facebook or Instagram pages. From here, you can learn more about how you can donate or organise your own fundraising events. For keen runners or easy-going walkers, you can join Cancer Research on their regular Race for Life events, held across the UK.